In the summer of 08, we experienced the first time in 35 yrs that we weren’t ‘parenting’ on a full time basis. Our ‘baby’ of 6 graduated high school and was heading to UGA, and we were led to begin something we had heard a call to for several years. Both of us had degrees in Theology, and had been in part time ministry for decades; teaching, doing music, speaking, volunteering, etc. Jerry had traveled extensively being a keynote speaker and management consultant, and Cricket had been a speaker and leader for the 3rd order Franciscans and many days of reflection, retreats, etc. We decided to leave the security of our job and home and purge our possessions. We began to hit the road in a motorhome not much bigger than a closet and be ‘on call’ for where the Lord would lead us to serve with our gifts. In 2000, Jerry had visited a caravan of 25 motorhomes who were ‘full timers’, ie, they lived in them. This bunch were plumbers and pastors and physicians who followed the red cross to areas of need. In their semi-retirement, they gave of their career expertise to help people. Cricket thought we could do that for people in parishes, through service, prayer, and music. Jerry’s extensive career in education and consulting had led him to believe that corporate cultures are places full of wounded people; folks who had let the time + mental demands of their careers relegate the very time the soul needs to pray and rest and lead become an ‘afterthought’. We thought the best way to challenge this trend was to live an alternative; with little preparation Jerry left his Directors’ position and salary and benefits and did not accept several offers to continue in the career that had blessed him. With gas prices doubling weekly, financial markets drowning in crisis, and most people thinking that ‘holding their own’ in the present would be a good thing, we embraced a ‘spirituality of subtraction’ in the tradition of St. Francis. Jerry’s music is recorded with our daughters doing wonderful vocals, and these cd’s are to help people pray. Cricket’s books and talks are focused in how to follow a call to Franciscan spirituality in family and society. Our retreats, missions, and days or nights of reflection are offered wherever our wheels will take us! 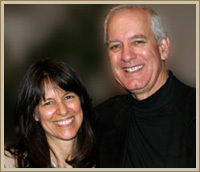 Jerry and Cricket are a gifted and blessed husband and wife retreat team. 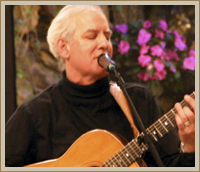 Jerry, an accomplished musician, brings a serenity of spirit through the instrumentality of voice and guitar. Cricket, a seasoned retreat animator, shares her Franciscan spirit and radical love for God rooted from the Gospel and her marriage. May the Aull's bring you their gift of sacramental love as you share a retreat experience with them. You will be blessed." "We began to hit the road in a motorhome not much bigger than a closet and be 'on call' for where the Lord would lead us to serve with our gifts." "With gas prices doubling weekly, financial markets drowning in crisis...we embraced a 'spirituality of subtraction' in the tradition of St. Francis."